The unHOOKum tool truly is simple, quick and easy. There are no handles to squeeze, no jaws to close or levers to pull. It does not attach to your line! The unHOOKum is designed to be a one-handed tool. The unHOOKum tool allows you more fishing time! It simply slides under the hook, quickly and easily removes hooks and lures, extends fly life and protects terminal tackle. The unHOOKum tool is designed for a wide variety of fishing: it's extremely versatile, ideal for ALL freshwater fish from Trout, Grayling and Salmon in the North and West, to all the Panfish, Bass (Large & Smallmouth) of the South and East. The unHOOKum's polished stainless steel tip works for all inside saltwater fish from Speckled trout and Redfish to Bonefish and Permit. Whether you use poppers and streamers, small flies, beetle spins and jigs, crickets, grass shrimp, etc., you'll not find a better dehooking tool. The stainless tip, tapered body and diamond-cut cushion grip make the unHOOKum innovative and unique. The entire stainless tip is polished and the tip ends are rounded to protect your fish. They are angled outward at 45 degrees to help guide the hook into the capture loop without having to see the hook bend. In contrast to almost every brand of dehooker on the market, the unHOOKum will not damage your lures and flies. Insert the unHOOKum into the fish's mouth under the hook and slide it rearward, centering the tip on the hook bend. Push back (in) against the hook firmly. 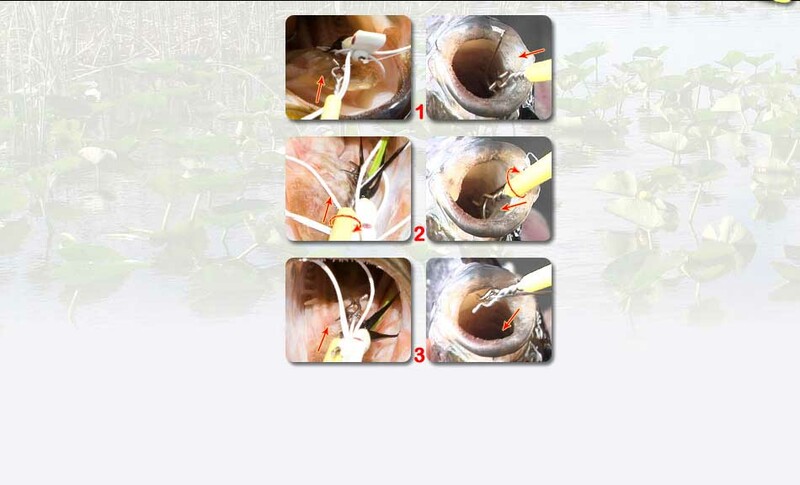 The hook will snap into the capture loop and travel to the rear of the loop. Rotate the tool a quarter turn clockwise (rotate to the right), pinching the hook in the tip. Push back (in) and up to dislodge the hook barb. Remove the lure or hook captured in the tip! * Be firm but gentle when pushing. It does not take a lot of force to remove the hook. Take your time on the first few fish.